Consumer trust in the banks has taken a huge hit since the 2008 crash and continues to be buffeted by an ongoing series of scandals. Where once Bob Diamond and Barclays were in the headlines, HSBC has now taken on the unwanted role of banking baddie. Online chat about HSBC increased by 1300% from January to February. This had the effect of causing its social-media reputation score to rise (see below), but the research by Psona found overall levels of sentiment toward HSBC declined significantly, from 49 in January to 23 in February and 25 in March. 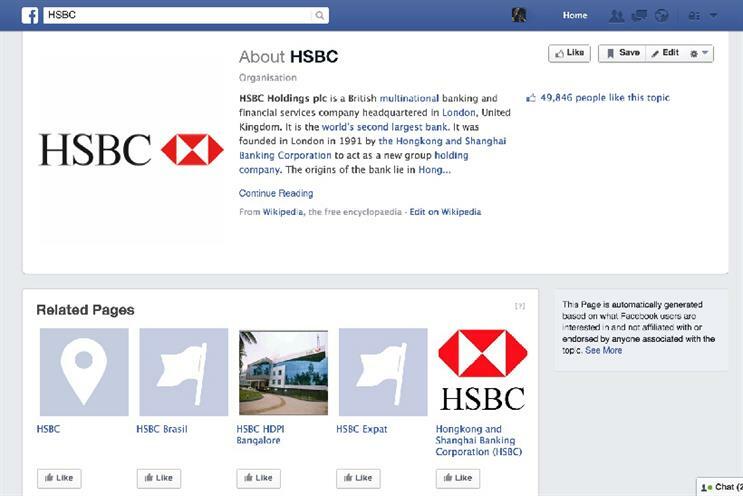 Despite the engulfing crisis, HSBC continued its social-media activity in support of its ‘Pink ladies’ ad. But a period of reflection might have been wise; a Facebook post showcasing a video on expats drew derision and, worse, appeared to have been algorithmically pushed to users reading about the bank’s tax arrangements. 44 - December "Illegal financial services", "money laundering" and "organised tax fraud" were just a few of the key terms discussed throughout December in relation to HSBC. Writer and journalist Ian Fraser led the social commentary, attracting 286 retweets when he branded HSBC a "criminal enterprise". 49 - January HSBC looked to move on from the recent controversy, launching its 'Pink ladies' ad in late December. It went on to attract more than 400,000 views on Facebook, compared with just 12,000 on YouTube. The ad brought a new-year influx of positivity for the bank. 52 - February BBC's Panorama put HSBC under the spotlight. The bank suddenly became the centre of attention in the UK after the documentary charted how the bank helped clients evade tax on a massive scale. The bank was mentioned online more than 50,000 times on Monday 9 February, when it aired. 50 - March The revelation that Rona Fairhead, chairwoman of the BBC Trust, is paid £10,000 a day by HSBC for a non-executive role, attracted criticism. Later in the month, The Guardian's editor-in-chief, Alan Rusbridger, claimed the bank ordered the paper to destroy all documents related to the investigation into its tax affairs.